This practical reference provides in-depth information required to understand and properly estimate compressor capabilities and to select the proper designs. Engineers and students will gain a thorough understanding of compression principles, equipment, applications, selection, sizing, installation, and maintenance. The many examples clearly illustrate key aspects to help readers understand the "real world" of compressor technology. 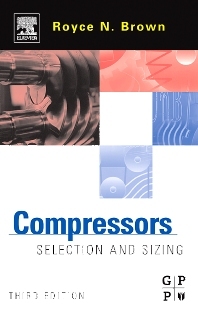 Compressors: Selection and Sizing, third edition is completely updated with new API standards. Additions requested by readers include a new section on diaphragm compressors in the reciprocating compressors chapter, and a new section on rotor dynamics stability in the chapter on diaphragm compressors. The latest technology is presented in the areas of efficiency, 3-D geometry, electronics, CAD, and the use of plant computers. The critical chapter on negotiating the purchase of a compressor now reflects current industry practices for preparing detailed specifications, bid evaluations, engineering reviews, and installation. A key chapter compares the reliability of various types of compressors. Everything you need to select the right compressor for your specific application. Practical information on compression principles, equipment, applications, selection, sizing, installation, and maintenance. New sections on diaphragm compressors and an introduction to rotor dynamics stability. Process Engineers, Mechanical Engineers, and Technicians in the hydrocarbon process (petrochemical, refining, gas transmission), paper and pulp, and associated industries that apply compression equipment, EPC contractors (Engineering and Procurement Contractors such as Bechtel, Brown and Root, Chiyoda, etc. that usually are between the user and the compressor vendor in the purchase and construction phase of projects), and consultants, (professional job titles such as: Rotating Equipment Engineer, Facility Engineer, Mechanical Engineer, Procurement Specialist). Royce N. Brown is the owner of RNB Engineering, a consulting firm in Houston. He is a registered Professional Engineer in Texas, Michigan, Louisiana, Wisconsin, and California, and a former consulting engineer for Dow Chemical.